This is yet another one of those Monday detox recipes – after too much merriment at the weekend, we were desperate for some vitamins. 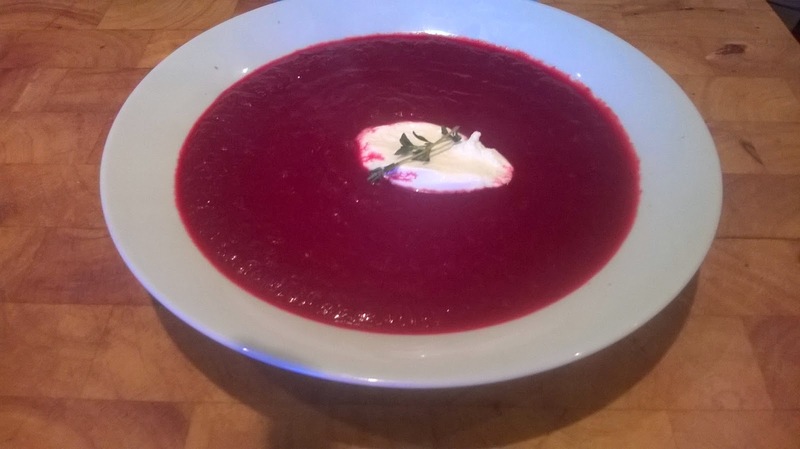 You might have noticed I use beetroot fairly often in my recipes; not only do I love the sweet, earthy flavour, but it’s also full of good things – see here for the benefits! This is a very easy recipe and will serve 4. If you have time, crisp up some onion slices and sprinkle on top when you serve, they’ll add some fantastic texture. 1. Remove the stalks from the beetroot and cut into 1cm chunks, no need to peel. 2. Peel the onion and chop into segments – like an orange. Put into a large roasting tray with the beetroot and drizzle with the olive oil. Sprinkle over most of the thyme and put in the oven at 170 degrees for 30-40 minutes, until the veg is softened. 3. When the veg is cooked, tip it into a large saucepan (take out any tough sprigs of thyme) and cover with the stock. Bring to the boil, taste and season with salt and pepper. 4. Blitz the soup in a food processor until smooth. 5. To serve, top eash bowl of soup with a dollop of soured cream.